Home » Baseball » Congrats to the 2018 World Series Champs: THE NEW YORK YANKEES!!! Congrats to the 2018 World Series Champs: THE NEW YORK YANKEES!!! The Yankees went from a MIDDLE of the road team in 2016 to now being the FAVORITE to win the World Series in just TWO years. The second coming of GOD, Brian Cashman pulled off another robbery, this time the victims were the Miami Marlins and Derek Jeter. The Yankees were ALREADY one of the BEST teams in the American League going into the 2018 season, they had TWO of the BEST home run hitters in all of baseball, but Cashman wondered, “How could it get better?” So he opened up his phone book to make some calls and ended up with the National Home Run Leader from the 2017 season, GIANCARLO MOTHERF*CKING STANTON!!!. He is the cherry on top of the TWO cherries that were already on the Sundae, so saying the Yankees will hit a lot of home runs next season is an understatement. It is still unclear, as to what the Yankees are going to have to GIVE UP in order to give up to get Stanton, but multiple reports are saying that is Starlin Castro and bunch of “Not Top-Level” prospects, so this is definitely a ROBBERY for the Yankees. The reports are also saying that this deal does not affect their MAIN GOAL of the off season of getting under the Salary Tax Threshold, as they will still get under it EVEN after acquiring Stanton. That is the biggest POSITIVE sign for Yankee fans, even bigger than actually acquiring Stanton, because this ALLOWS ownership to spend FREELY next off season to sign BIG free agents to make the Yankees even BETTER. Stanton has a BLANKET No Trade Clause and can decline this trade, so we could just be getting hyped up for no reason. However, all the baseball NERDS on Twitter are saying that this deal will get done and Stanton will WAIVE his No Trade Clause. 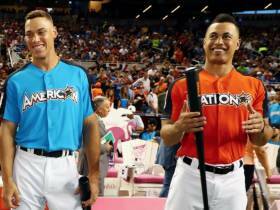 The HEART of the Yankees’ lineup next season is going to be Aaron Judge, Gary Sanchez, Didi Gregorious and now Stanton. These FOUR guys managed to hit 169 home runs last season, while the ENTIRE Red Sox team, the main competition of the Yankees, combined to hit 168. The Yankees still have VALUABLE contributors in Brett Gardner and Aaron Hicks so as a team they could easily hit 250!!! home runs next season. The short porches at Yankee Stadium are perfect for Stanton who is going to be in contention to BREAK Barry Bonds’ single season home run record if Stanton can stay healthy all season long. The Yankees are getting a GREAT bat in Stanton, who led the National League in home runs last season and was the NL MVP, BUT the Yankees have been BURNED by acquiring NL Home Run Kings in the Past. We all remember the struggles of Chris Carter in 2017, well he was the NL Home Run King in 2016, so EVERY Yankee fan is praying that history DOES NOT repeat itself. The Yankees plan all along was to get under the Tax threshold prior to the 2018 season, so that they can spend BIG in the 2018 off season to possibly sign TRANSCENDING talents like Bryce Harper and Manny Machado. What if I told you that this deal with the Marlins DOES NOT STOP them from signing those guys. Though I do not know where they would put Harper if he came to the Bronx, but they would figure out a way, so acquiring Harper now seems like a pipe dream. Yanks could still go get Machado next winter. I could not end the Yankees acquiring GIANCARLO MOTHERF*CKING STANTON blog without thanking the Marlins CEO, “Number 2” Derek Jeter “Number 2”. Jeets won FIVE World Series with the Yankees as a player and now set them up to win ONE, TWO, possibly THREE World Series as his first big move after becoming part owner of the Marlins. He had said all along that his first goal with the team was to SHED the highest salaries on the franchise so he called up Cashman and got rid of the HIGHEST paid player on the Marlins. I have already put my chair down for the PARADE down Canyon of Heroes next November, you should do the same, because the NEW YORK YANKEES are about to win the 2018 WORLD SERIES!! !